The nature always offers a wonderful beauty and become tourist destination. 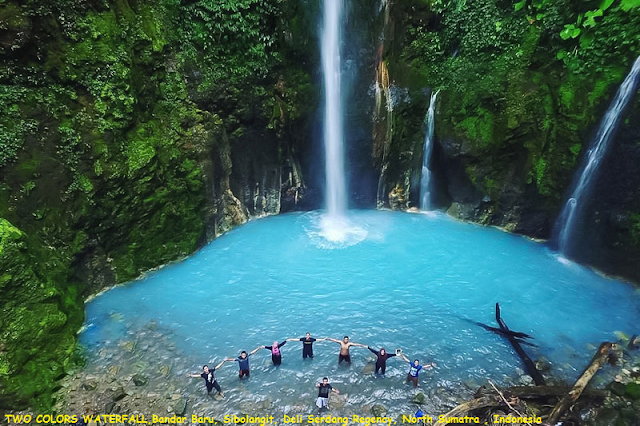 One of them is Dua Warna Waterfall is located in Durin Sirugun village, Sibolangit sub-district around 75 km from Medan. Dua Warna waterfall was formed as a result of Mount Sibayak’s explosion hundred of years ago and the water originates also from Mount Sibayak. As the name implies, this waterfall has two colors, light blue water while it falls and greyish white below. The colors of the water are influenced by phosphorus and sulphur contained in the water. Because of those chemicals it’s quite dangerous to drink the water found at this waterfall. So be careful while you swim in the water.